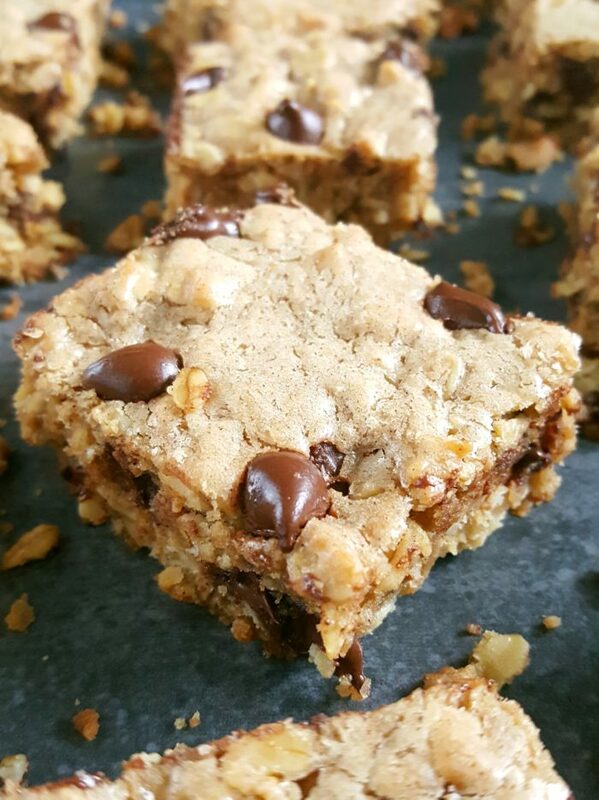 Easy recipe for oatmeal chocolate chip cookie bars made with rolled oats, brown sugar, and melted butter. They’re oh so chewy and delicious. Perfect for the lunchbox or an on-the-go snack! These chewy oatmeal bars are made with brown sugar which gives them plenty caramel flavor and moisture. The butter adds flavor and richness as well. And the chocolate makes them irresistibly good. 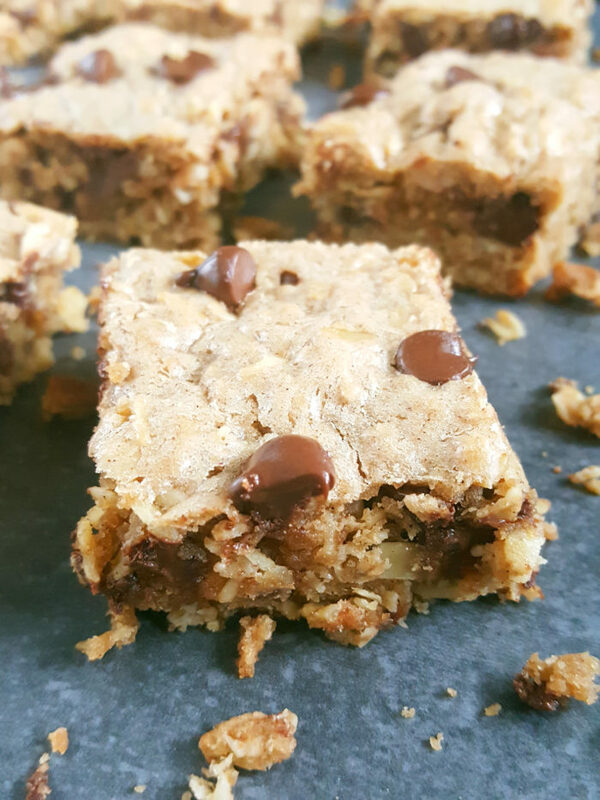 All of these elements are what makes this recipe for oatmeal chocolate chip bars taste so delicious. 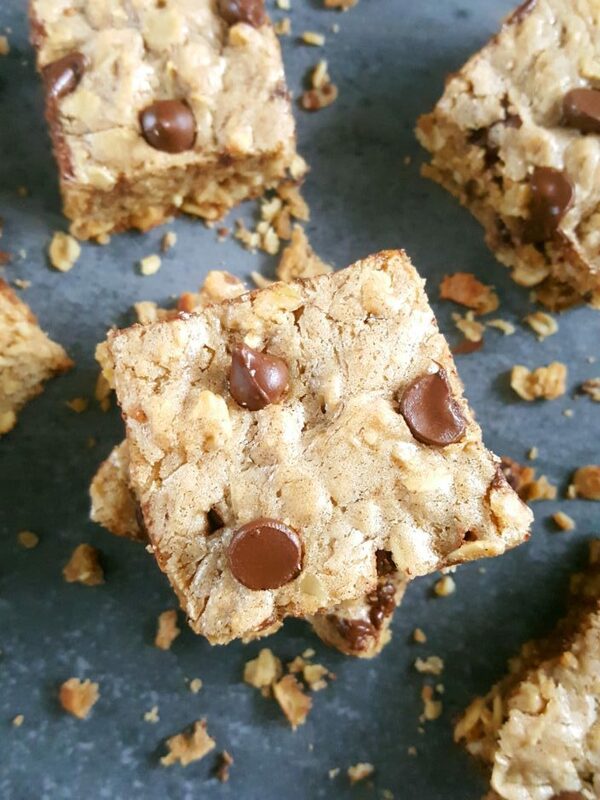 They’re like chewy blondies with oatmeal and chocolate chips. You’re going to love them! This recipe calls for simple ingredients, takes 10 minutes to mix together and after it’s all mixed up all you gotta do is dump it into the pan! So it’s not only an easy recipe, but a quick and convenient one too. It’s also a kid-friendly recipe to eat and to make as well. Since it’s basically a ‘mix n dump’ recipe kids can lend a hand without it being complete chaos. Chocolate chip dessert bars like this always come in handy when one is in need of a quick and easy dessert. If using unsalted butter, double the amount of salt. You’ll notice that this recipe calls for 1 tablespoon of vanilla extract. No, it’s not a typo. 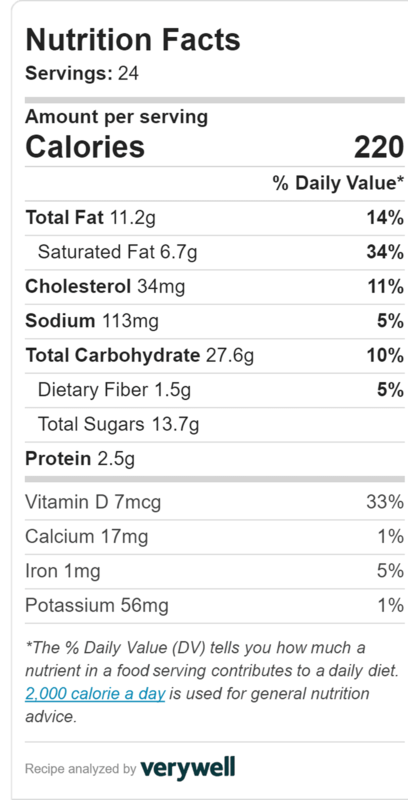 Yes, it’s is a bit more than average however, that is also what makes these oatmeal bars so flavorful. Feel free to use milk chocolate chips if that’s all you have on hand. Rolled oats are also known as old fashioned oats, whole oats, or large flake oats. 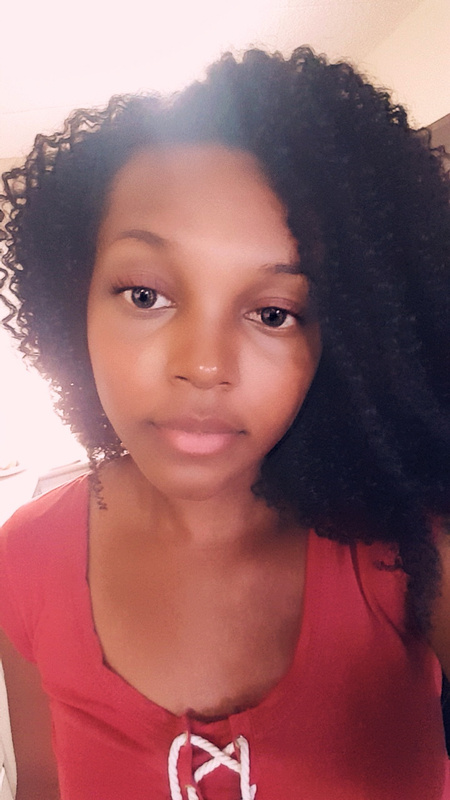 They’re flatter than steel cut oats but thicker than instant oats. When processed, the oats are dehusked and steamed, rolled into flat flakes and slightly toasted and they usually have the tough brand removed. Rolled oats are most commonly used in baked goods. This recipe for oatmeal cookie bars is made completely with brown sugar. It doesn’t matter which brown sugar you use. The only difference is that dark brown sugar will make the bars more rich in flavor. The brown sugar is not the only thing responsible for the chewy texture of these bars. The melted butter helps in creating that as well. When melting the butter do not overheat it. I know it’s very easy to overheat butter, especially when doing this in the microwave. Remember, you don’t want the butter to be too warm otherwise it will cook the egg. However, if you do happen to go overboard and the butter ends up being too hot, let it sit until it cools down before adding any other ingredients into the bowl. The bars are done when they are light brown, the edges are set and the center is slightly under baked. Also, it should be equally soft and firm to the touch. If there’s still a raw spot in the middle it means that they need to be baked for a minute or two more. You don’t want the middle to be raw, just slightly under baked. The bars will firm up and continue “baking” as they cool. Do not over bake the bars otherwise they will be dry. In a large bowl combine butter and brown sugar. Beat in the eggs and vanilla extract. Whisk together the flour, oats, salt, and chocolate chips in another large bowl. Spoon batter into the baking pan in an even layer. Bake for 19 – 20 minutes. These oatmeal bars make for such a simple dessert. They taste like oatmeal chocolate chip cookies but in bar form! They’re also great for a snack as well because they aren’t overly sweetened which makes them perfect for the lunchbox and much better than those flimsy oat bars you get at the grocery store. Homemade treats like these are always the best. They taste best fully cooled and even better the next day! And they pair perfectly with a glass of milk. Store the bars in an airtight container , food-safe resealable bag, or cover tightly with foil. They don’t stale quickly which is great. My bars lasted for over a week at room temperature. 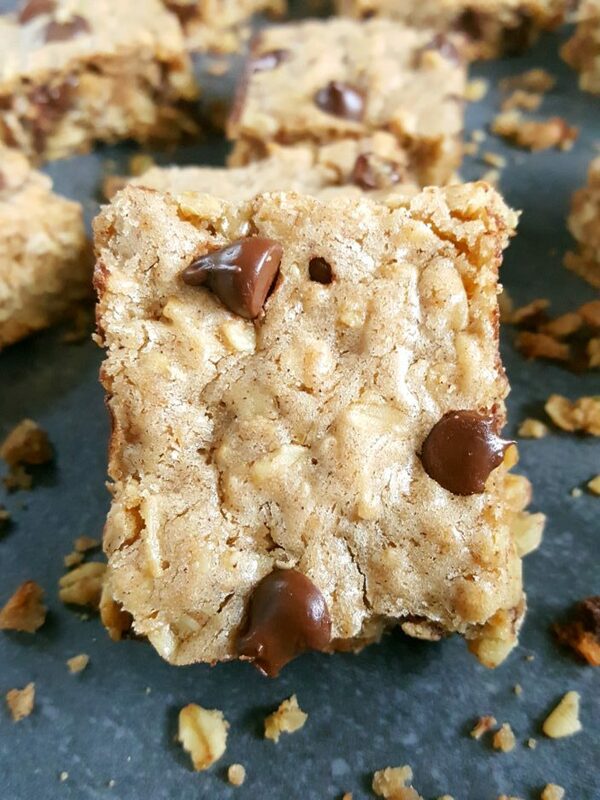 If you prefer an even quicker oatmeal bar recipe without chocolate chips try this one instead. 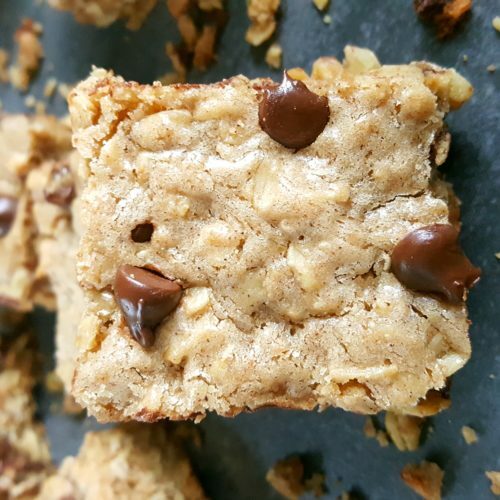 Easy recipe for oatmeal chocolate chip cookie bars made with rolled oats, brown sugar, melted butter, and spiced with cinnamon. They’re oh so chewy and delicious. Perfect for the lunchbox or an on-the-go snack! Preheat oven to 350°F. Line a 9x13 inch baking pan with parchment paper or foil and set aside. *Note that if using foil the edges of the bars may brown/crisp quicker. In another large bowl whisk together the flour, oats, salt, and chocolate chips. Add the dry ingredients to the wet ingredients and mix until fully combined (batter will be thick). Bake for 19 - 20 minutes until light brown, equally soft and firm to the touch, and slightly under baked in the center. Do not over bake.